Three machines in one - value for money or low quality? These days, office workers don't seem to want to buy separate scanners, printers or photocopiers. All-in-ones are now all the rage, because buying three peripherals in one can save a small fortune and free up workspace for other things. Epson is aiming its CX6600 at the small office user, by incorporating its DuraBrite ink technology into an all-in-one that also features a built-in digital camera card reader. DuraBrite inks are formulated from pigments rather than dyes. Because pigments are formed from larger molecules than those that make up dyes, the image printed with pigments are less prone to fade or break up as a result of atmospheric pollution such as ozone. Pigments also dry instantly and are smudge-proof. This makes the CX6600 ideal for printing notices or photos that will be exposed to air and light for some time. This is perfect for users who need to print out and display colour notices, such as estate agents. However, before all you house-sellers leap from your chairs to buy a CX6600, we ought to point out that there are a few drawbacks to using pigment inks such as DuraBrite. Pigments produce dull and slightly unattractive photos that are prone to scratching when printed out on photo paper. This is a shame, as the CX6600 also comes with a full set of memory card slots. If you like your prints to be glossy, this model isn't the all-in-one for you. 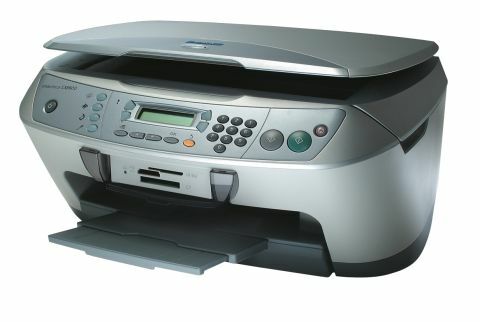 As a colour text printer, scanner or plain old photocopier, the CX6600 functions well enough. The running costs are reasonable, thanks to separate tanks for each of the three colours inks and the black that the CX6600 uses.